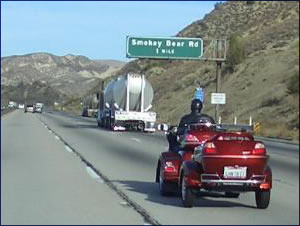 Have trailer--will travel; that's the spirit here at SO CAL TRIKE CENTER. Hitching up your bike, trike, or sidecar rig with all your gear to head out on the highway gives freedom a whole new dimension. From cross-country adventures to road-trip getaways, take life on the road to the next level with a motorcycle trailer from SO CAL TRIKE CENTER. Cool road signs are part of the journey. Come on down and get hitched with SO CAL TRIKE CENTER, today! With hundreds of miles of hitched-up saddle time under our belts, our expertise comes first hand. SO CAL TRIKE CENTER is your dealer and service shop for names like California Side Car/Escapade, Champion/Colorado Sport, Road Dog, and Thoroughbred-Motorsports/GLT/Lil' Deuce/Colt motorcycle trailers, just to name a few. From mounting your hitch to sparking the taillights, always trust your trailer set up to the experienced technicians here at SO CAL TRIKE CENTER. Whether you're already towing or simply exploring the idea of trailering, hitch up with SO CAL TRIKE CENTER for all your motorcycle trailer needs. Along with road-tested advice from your fellow motorcycle trailer enthusiasts-- your bike, trike, sidecar and trailer are in the skilled hands of trusted technicians.